“When you step into a shipping container, it’s like a safe haven,” said Alex Wilson, who does sales and marketing for Container Alliance, a Santa Barbara startup that sells, rents, and modifies shipping containers, and coordinates a network of similar businesses around the country. The hulking, corrugated steel boxes that look like a massive Rubik’s cube when stacked on the decks of cargo ships are so solidly built that they have proven not only durable but eminently reusable. And with hardwood floors and impermeable walls, even livable. It has been fashionable in avant-garde architectural circles for the past decade or so to design dwellings out of cargo containers which were piling up unabated on docks in U.S. port cities. With the sputtering economy, there is actually a shortage of containers now, explained Geoffrey Fargo, founder and president of Container Alliance, whose job it is to find a market for containers far away from seaports. Most containers — which are retired from shipping after 10-12 years — are used for storage; the Santa Barbara Unified School District, Lynda.com, and Harbor Marineworks are all local customers that have purchased containers for this purpose. But Container Alliance also owns a fabrication facility in which it modifies containers for novel applications. One, insulated and air-conditioned, houses the computer controls for the San Gorgonio Pass Windfarm in Riverside County. The company carved up another to transport and display bicycles for Specialized during the Amgen Tour of California. The company designed some for Hurley to warehouse and display merchandise, and lopped off the top of another to store and display stand-up paddleboards for a business in Seal Beach. Many — with doors added — are planted on construction sites to serve as temporary offices. The modern shipping container was developed in 1956 by trucking magnate Malcolm McLean so that it could be stacked easily and transferred from ship to truck to railroad car without ever being opened. Since then, containers have become standardized so that they are easily stackable with interlocking corner fittings. They are now the primary vessel of passage for goods that travel around the world via international trade. Most are built in China and Singapore; if they were manufactured domestically, Fargo estimates, each container would cost $10,000-$12,000. 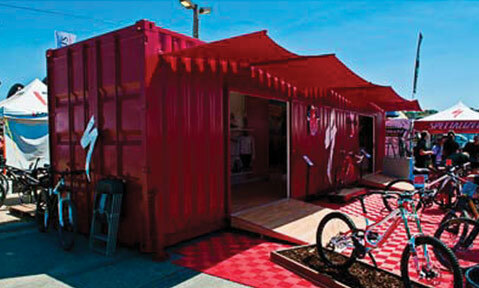 The transportability of containers adds to their attractiveness as candidates for repurposing. The Specialized bike display, for example, could be easily moved as-is via truck as it travelled among tour stops. Recently, Container Alliance teamed up with the Cal Poly architecture department to sponsor a contest in which students designed transitional housing for Haitians displaced by the earthquake. The containers could ship with all the materials necessary to turn them into abodes right inside.